Play Party Games Slotto and come and join the retro party we’ve got going on here. This slot brings together so many favourite symbols and features from classic slot games and turns them all into one, fun party! It packs together old-school symbols, familiar music and classic features and we have no doubt that any slots player, beginner or expert, will enjoy this game. 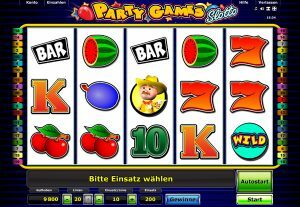 It will be especially fun for those who like to play our other slots, such as: Jolly Reels, Happy Fruits and Lightning Wild. That’s right: there’s a lot of symbols in this game and we bet you’ll enjoy all of them! There are juicy, red cherries; purple plums; vibrant watermelons; card values from 10 to King; black bars and red sevens! Spin three or more matching symbols on an active winline in order to get a payout – but remember, like many other slots, the matching symbols need to fall on consecutive reels from left to right. With 5 reels and 20 paylines, there are plenty of ways to win! Let’s get this party started! Like many other NovomaticCasino.co.uk games, you can play Party Games Slotto for free until you’re ready to play with and win real money! Once you’ve got the hang of the game and how it all works, you can use the game’s ‘autoplay’ function to spin the reels for you while you do absolutely nothing! This party does not need to involve any continuous, monotonous clicking! Pow! If you want to see how much you’ll get paid when you spin a win, the paytable is where the party’s at. It’ll tell you how much each combination of symbols will pay out according to your bet. If you want to heat it up and increase your bet, or cool it down and decrease it, you can do so by using the plus and minus buttons to change the number of lines you’re betting on, and how much you’re betting on each line. Your current bet amount will be displayed at the bottom of the screen, along with your credit balance and your last win amount. We’ve all been to parties where we’ve not really known anyone and somehow been forced into playing some lame party game, which you really aren’t into! This won’t be the case when you play Party Games Slotto – you’ll really want to join in with the game! You’ll have the chance to do so whenever you spin three or more Sheriff symbols in a winning combination! When this happens, you’ll trigger the ‘Pick a Prize’ feature and you’ll come face to face with three characters: a nurse, a maid and a chef. Choose one to reveal a bonus amount of cash which will be added to your balance! The other characters will reveal their amounts after you’ve chosen so you can see whether or not you picked the highest one! The sheriff isn’t the only special symbol, though. There is also a Wild symbol which substitutes for any other symbol! After you’ve finished playing this party slot, why not join the after party and see what else NovomaticCasino.co.uk has to offer? There are plenty of other slots and jackpot slots which you’re sure to enjoy. NovomaticCasino.co.uk also has a wide range of table games and live dealer games which are so much fun. The live dealer games are streamed to you from live tables with real dealers! You’ll feel as if you’re playing in the middle of a glamorous casino, yet you’ll be sitting in your very own home! Check them out now and choose from: Live Baccarat, Live Blackjack, Live Poker and Live Roulette.